In some respects, reaching Orvieto (located in the southern part of the region of Umbria) is much like visiting an island because it takes some effort to get there. The medieval walled city sits on a high plateau of volcanic ash stone (Tufa) about 1000 feet above the valley. Although you can drive up hairpin-curved roads leading to the town, the chances of finding a parking spot are iffy and all the discoveries seem to be in pedestrian-only squares and alleys. As a result, many tourists leave their cars in the public lot below and ascend a series of underground ramps, steps and escalators by foot (taking approximately 10 minutes) to reach the top. In addition to being able to see all the town’s architectural, art and crafts treasures, one of the rewards of emerging from underground on a Thursday or Saturday morning is being able to visit the bustling outdoor market held in the Piazza del Popolo. Set on cobblestone streets, the square is anchored by the Palazzo de Popolo (The People’s Palace), a Romanesque-Gothic palace that now serves as a conference center. On market days, the square and surrounding streets are filled with haphazardly arranged trucks and stands as shoppers weave their way around them. Many cooking classes for tourists also begin here with students shopping with their chefs. The market is a destination for both young and older townspeople. This centuries-old market offers a mix of food, vestiti (clothes) and home goods. The region of Umbria has been dubbed the “green heart” of Italy because it is so rich in wine and agriculture; farmers and artisanal producers from the surrounding countryside arrive at the market in Orvieto early in the morning to sell their products. They close up just in time for the lunch hour. Like many in Italy, the market in Orvieto is far less manicured (and costly) than those in France. Umbrian cooking is characterized as being simple in recipes and technique but made with outstanding ingredients. Walking through the market with all the local, seasonal food products, we only regretted that our hotel room didn’t have a kitchen. If we had to name the one standout of this colorful market, it would have to be the truck just inside one of the alleys leading to the square that sells porchetta. Often sold in roadside stands throughout Italy, porchetta is a boneless, moist pork roast stuffed with herbs and traditionally cooked over wood. The meat is usually eaten as part of a warm sandwich (panino) with a crisp piece of fatty skin adding to the savory taste. Every time we see one of the white porchetta trucks on the road, my husband lusts over this dish that is so popular with working men across the country. Because it was too early for lunch, we ordered two panini wrapped to take home to our hotel. It’s always better to arrive early in the morning when the crowds are less dense. Be sure to have your Italian dictionary and some knowledge of metric measurements if you are planning to purchase fruits, vegetables or nuts. We think we’d like Orvieto, browsing the market, cooking up a meal with all those freshly-bought goodies… But then we’d need an apartment to cook up a meal. Maybe we’d have rent a place and stay a while? Our visit to Umbria left us with precisely that feeling…wanting to stay longer and see more. We have a restored farmhouse that we rent out just 8 miles outside of Orvieto. It is a truly wonderful town but there is also lots to see in the area. Lake Bolsena and Montifiascone are very close. Orvieto is just one hour away from Rome and two hours from Florence – by train. Hmmm you bring up a great point. I absolutely love to visit these markets when I travel, but it would be so much more fun bringing home a bag of ingredients to make a delicious meal. Talk about “locally sourced”! Weren’t those cranberry beans inspiring? I drooled all over my keyboard! Between the cheese and the porchetta I didn’t know which way to turn! Love markets, and this is definitely one that I would enjoy. Did you manage to take a cooking class? We absolutely love Orvieto, and we love markets anywhere, but especially in Italy. That makes this just about perfect in our book. Definitely a very special place in a very special country! Orvieto looks lovely. I’m with you- the porchetta is definitely a standout. Hope you get to visit, Billie! Oh we didn’t get a chance to go to an Italian market! And you said the magic word…cheaper than France! And we were able to go in France. Porchetta sounds like a winner! With local cheeses, both will be good with wine. No need to cook! Yes, a perfect place to rent an apartment and live like a local! My mouth is watering! The porchetta sounds amazing and I love your pictures. 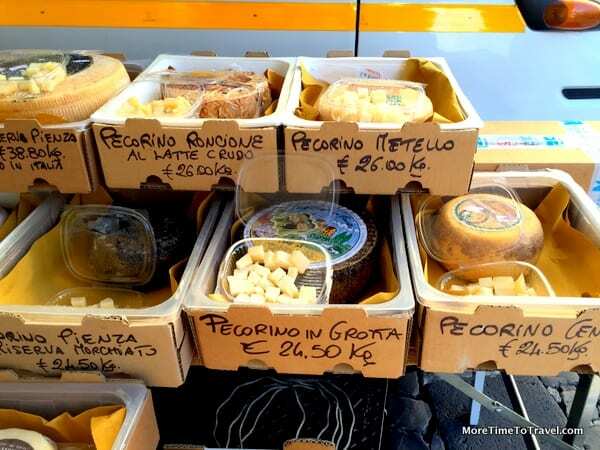 I never knew there were so many kinds of pecorino cheese! I’d love to explore Orvieta too! I didn’t know about the different kinds either! The markets in Italy are so much fun and Orvieto is no exception. The porchetta trucks always seem to be very popular. I’ll never forget the first time we headed to the markets when we were staying in an apartment and could actually buy whatever we wanted instead of just looking. Such freedom! My next stay will be longer—and in an apartment! I’m mulling (which means thinking about but doing nothing) a home exchange or two in Italy for 2016 and this post inspired me to at least go on the Home Exchange site and check out a few places in Umbria. Love the market! It’s really a lovely region with far fewer tourists than Tuscany! Your photos of Orvieto, the market and porchetta are making me miss Italy. We stayed in a little village on the Tuscany/Umbria border several years ago and it’s still my favourite travel memory! This post made me so happy. We spent 3 months in Ficulle last winter just a half hour away and spent a lot of time, including every Saturday morning, in Orvieto, some times driving up, some times taking the funicular, such a great town. I agree with you-an apartment in Italy is a very good idea. I loved visiting my daughter in Florence. We had the chance to shop the market and then come back and create a meal. The food is so delicious and fresh. gives you a whole different perspective. Sharing an apt with your daughter surely made it even more special!